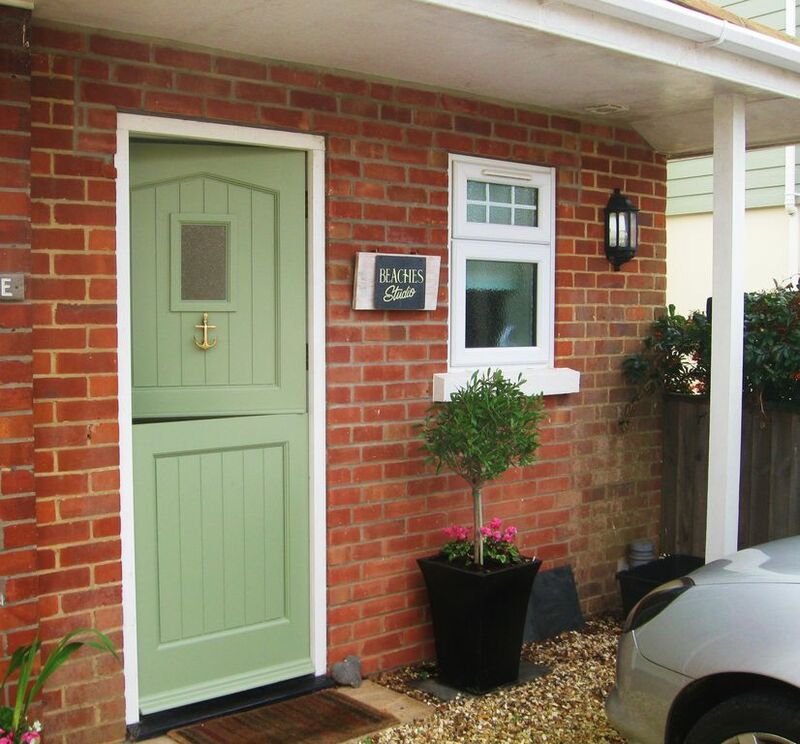 Beaches Studio in Milford on Sea, Lymington, New Forest, Hampshire, England - Peaceful Location Approx 5 Mins Walk to the Beach and Local Amenities - no need to use the car!! Beaches" is a contemporary bright studio offering light and airy accommodation with a feeling of tranquility The location is perfect - approx 5min walking distance from the village shops, beach, cafes, pubs, restaurants and village green. You can walk to Keyhaven where you will find a pretty pub, Keyhaven harbour and the marshes, very popular with bird watchers. A ferry can be taken from Keyhaven to Hurst Castle or if you are feeling energetic you can walk along the shingle bank; great for bird watchers who would enjoy the walk along the salt pans heading to Lymington. Or 10mins drive to Lymington with its Georgian architecture, pretty quay, individual shops and the bustling Saturday market. Just 15/20 mins drive from the New Forest, Beaulieu, Christchurch and only 35mins from Bournemouth with its long golden beautiful sandy beach. Bournemouth is also very good for shopping, theatres, pubs, restaurants and nightclubs. Hi we are Bob and Sue and we have lived in Milford for 25yrs. Our house and studio, we think, is in an idyllic spot. We have enjoyed bringing our children up here, our son Tom now lives in Oxford and is a rowing/sports coach, he enjoys cycling and surfing. Our daughter Isabella is at university in Oxford and is a mean netball player. We are always busy, I am a fitness colour consultant and Bob is involved with Hurst Castle. We both enjoy walking, cycling and the village events i.e music and food festivals, local pubs and resturants. We all like to travel and love the warm weather, we tend to go to Europe for some sun but always out of season as we have everything here within walking distance. The area offers so much we have are own village green, (Local events) butchers, deli, grocers, hairdressers, beautician not to mention a variety of pubs, restuarants, cafes and the beach. Keyhaven has its own quay where you can launch your boat and take a ferry to Hurst castle or Yarmouth, IOW, when in season. We have the marshes which is great for bird watchers, artists and walkers alike. There are plenty of walks and things to do in Milford. In the area we are 20 mins from the New Forest and the main Brockenhurst Train Station. We are only 35mins from Bournemouth which boast a lively main town with shops theatres nightclubs and resturants galore. As well as a long golden sandy beach. We love people staying in our studio so they also can enjoy the fantastic facilities Milford has to offer. The studio offers light and airy accommodation with a feeling of tranquillity, a perfect base all on ground level. From Beaches studio we enjoy a lovley outlook of the shingle bank and the Isle of Wight, we are south facing and this is an excellent base all on ground level. We are situated within walking distance of all the facilities that Milford has to offer. If you fancy a pub meal and a few drinks- no taxis needed here. You may like to pick up fish and chips, and sit on the beach of an evening and watch the sunset go down and just meander back. Or get dressed up and visit some of are nice resturants and walk back. Or simply stay in and enjoy a takeaway and sip wine on your patio. We offer off road parking outside the studio and arrangements can be made on request to collect and return from Brockenhurst or local train stations. En suite- spacious shower with quality fittings/ wc/ sink with mirror and light over. Opening window, extractor fan and toilet rolls. Lounge area with 2 seater sofa TV with Freeview and built in DVD. FREE Wi Fi access. Boat trips available at certain times of the year at Keyhaven only 10 min walking distance from the studio. We have a dry ski slope in Christchurch approx 25mins away. Barton-on-sea golf course is the nearest being approx. 12 mins away. 18 hole course in Lymington 15 mins or Highcliffe golf course 20 mins away. Notes on accommodation: Beaches studio is south facing and sunny most of the day. With views to the shingle bank and the Isle of Wight. It is suitable for older children, babes in arms. Non Smoking, No Pets. Outside: "BEACHES" studio has a small private patio and outside lighting with bistro table and chairs for enjoying those warm summer evenings. Cleaning / Towels / Linen / Maid service: Towels and linen are included and changed weekly. We had a very pleasant few days at the beaches studio. The studio is small but perfectly functional. Everything you need for a short break. We will definitely be back soon. This is such a wonderful place. Sue and Bob are very welcoming and informative. Superb location, the option to walk to Hurst Castle and into the village to eat, drink and browse was so relaxing. The property is compact but very comfortable and really quiet. A great night’s sleep in the lovely king size bed. The scones on arrival are a lovely welcome touch, and would give Mary Berry a run for her money! The Cave in the village is a real gem for a wonderful range of wine, cider and gin. Sue’s recommendation of the Indian was also a good one. My one complaint is I would like to have stayed longer so we hope to return and continue to explore. Perfect base for us while property searching. Local restaurants good especially the seafood one/fishmongers. It was amazing. Property was clean and had everything you needed. Would recommend. Compact but everything that's needed in a village with plenty of cafe's restaurants and pubs. Well placed for exploring and lots of attractions even out of season. Thank you for a lovely get away! We really enjoyed our short stay at Beaches Studio. We really enjoyed our short stay at Beaches Studio. Good location for town and local coastal walks. Sue made us feel very welcome, the studio was clean and visitor needs well considered. So glad you enjoyed your stay, I hope you had a good trip to the IOW !! You are welcome back any time ! Cosy and clean studio apartment in beautiful location. Friendly welcome with scones and fresh milk and brief introduction to local amenities. Easy to walk to Hurst Castle along the spit and around Keyhaven Marshes. Lovely shops, restaurants, and gin bar in Milford. Easy to get to Lymington with its cafes, pubs, and restaurants. A very enjoyable stay. So glad you both enjoyed your stay, your welcome back any time! Milford-On-Sea has a pebble beach approximately 10 min level walk from the studio. Stroll along the 2 mile promenade and enjoy a coffee, ice cream or stop for a cool glass of wine and enjoy the breathtaking views. The village and Keyhaven is also a 10 minute level walk from the studio. Bournemouth and Southampton airports are less than 15 miles away. New Milton, Lymington and Brockenhurst train stations between 3 and 10 miles away. A car is recommended to go further afield but not necessary if you wish to stay local. In the centre of the village is a traditional village green. Surrounding the green you will find a launderette, 2 small supermarkets, butchers (famous for his sausages) hairdressers,beauticians, fish and chip shop (very tasty) Indian restaurant- takeaways. Pizza/Bistro/ fish and Thai restaurants. On the sea front we have the marine cafe- restaurant/bistro and terrace with panoramic sea views to Hurst Castle and the Needles - definitely worth a visit. Swimming is safe from the beach and near the shingle bank wind and kite surfing is enjoyed. Barton-On-Sea is just a couple of miles along the coast where hand gliders can be watched jumping from the cliff top. Bike hire is also available in the village and there are many places you can cycle to; a favourite is Lymington along the old roman road or round the salt pans. If you go on a Saturday you can enjoy Lymington Market with its individual stalls. FOOD WEEK - 7 - 13th APRIL 2014 - LOTS OF EVENTS. Booking Notes: Conditions of booking: A deposit of £75 is payable at the time of booking to secure your dates with balance payable 4 weeks before your stay. All cancellations must be phoned if made more than 28 days prior to the arrival date you will inccur no penalty. Please ask to speak to Sue or Bob Springbett. Always check with us for possible last minute discounted bookings. Changeover Day: Saturday is our preferred changeover day but this can be flexible. Arrive from 2pm Depart by 10am Notes on prices: Short breaks are available. 3 nights high season 2 or 3 nights low season Always check with us for late availability prices.